Hanoi (VNA) - The National Inter-sector Steering Committee on Food Safety has established six inspection teams to monitor the quality of products to be sold for the Mid-Autumn Festival (Trung Thu). The festival, one of the largest to take place annually, is approaching, and the aim is to ensure public safety. 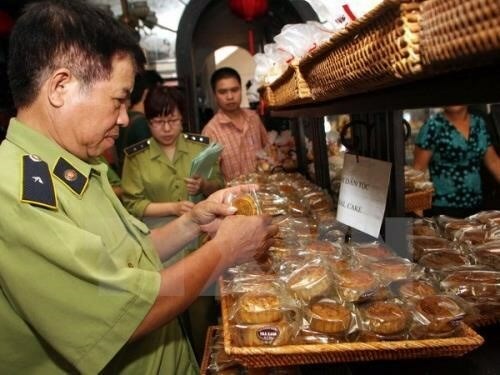 The teams will conduct inspection in 12 cities and provinces from September 11 to 30 at food manufacturing, processing and business facilities, especially those manufacturing and selling Mid-Autumn Festival products such as moon cakes, confectionary, beverages and meat. Large manufacturing facilities, wholesale markets, supermarkets, and food importing facilities will be under the spotlight. The teams include members of ministries of health, agriculture and rural development, industry and trade, and other units belonging to the National Inter-sector Steering Committee on Food Safety. The inspection, according to the Food Safety Department under the Ministry of Health, aims to prevent fake, low-quality products or those of unknown origin from being sold at the market. Inter-sector inspection teams at district and commune levels will conduct inspections at medium and small food stores. The steering committee ordered inspection teams to impose strict penalties on offenders and asked them to stop operating their facilities until the violations are addressed. Moon cake inspection is a regular activity conducted annually prior to the Mid-Autumn Festival, which falls on October 4 this year.